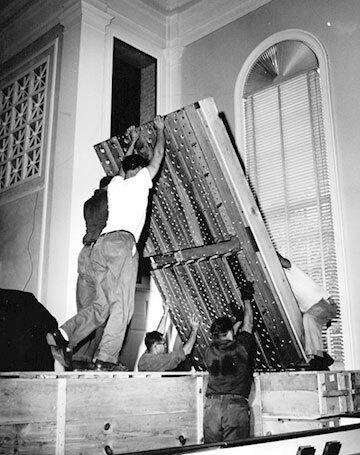 1956 Installation of the Möeller Organ. The original sanctuary organ was built and installed by M.P. Möeller Company of Hagerstown, Maryland. In 1959, the sanctuary was enlarged to approximately twice its original size. The wind pressure was increased and two new stops were added at that time. The three divisions were housed in the same chambers of the current organ, with the Swell in the south chamber, the Choir in the north chamber, and the Great in the center. The façade pipes were the 16’ Violone, a rank which was added to the Pedal in 1959. The organ had 1609 pipes arranged in 29 ranks, with 34 stops. 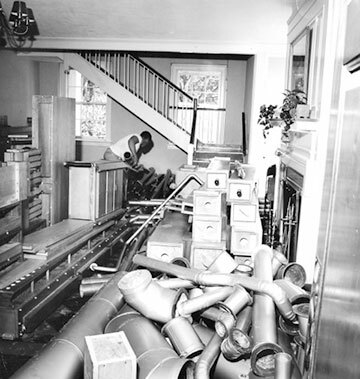 The action of the organ was originally electro-pneumatic, but was replaced with solid-state combination action in 1994 by the Bradford Organ Company of Evanston, providing ninety-nine levels of computer memory for each of the pistons on the organ.